Surely music to quarterback Matt Ryan’s ears, the Atlanta Falcons added a premier talent to their wide receiver room with their first pick of the 2018 NFL Draft (No. 26 overall) in former Alabama wideout Calvin Ridley, gifting Ryan a viable option opposite of star Julio Jones. 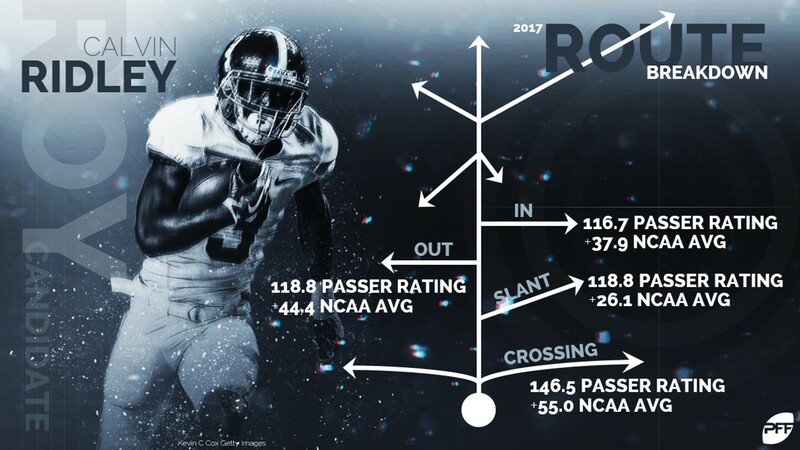 Our top-ranked wide receiver in the draft class, Ridley is a polished route-runner with surprising short-area quickness and long speed, all combining for an expansive route tree and high floor at the next level. He also earned 82.0-plus overall grades in two of his three seasons in Tuscaloosa. While his age (23) and inconsistent hands drew red flags throughout the pre-draft process, Ridley is in a perfect situation to prove doubters wrong early in his career given the level of talent the Falcons have both under center and atop the wide receiver depth chart. Atlanta shifted their attention to the opposite side of the ball on Day 2, selecting former Colorado cornerback Isaiah Oliver and South Florida interior defensive lineman Deadrin Senat. At 6-foot, 201 pounds, Oliver has great size and speed for the cornerback position, and his production with the Buffs follows suit. Oliver allowed fewer than 44 percent of his targets to be caught in each of his past two seasons, and he finished his collegiate career with 23 passes defensed and three interceptions. He also earned a career-high 85.3 overall grade. Senat is a better run defender than he is a pass-rusher, but he offers value in both areas of the game as a squatty, athletic nose tackle at the next level. He earned career-high pass-rush (80.1) and run-defense (86.7) grades in 2017, recording 26 total pressures and 37 defensive stops in the process. Of the Falcons’ three Day 3 selections, former Southern Miss running back Ito Smith may have the best chance to leave a lasting impact early in his NFL career. What he lacks in size, Smith makes up for in agility and toughness. In addition to forcing 188 missed tackles in his career, Smith ranked fourth in the draft class in percentage of tackles avoided on first contact (39.9).